We're kicking off our Summer guest blogger series this week! We are excited to be sharing posts from several awesome kid's bloggers this summer. We hope you'll love their posts and head over and check out all the other great ideas they have to share on their Facebook pages and blogs. 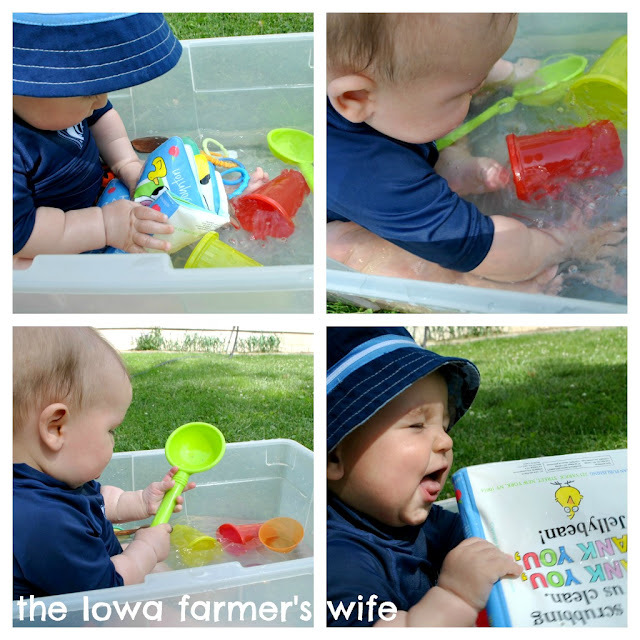 Today's guest blogger is Adrienne from The Iowa Farmer's Wife. We love the summer water activity that she is sharing! Hi! I'm Adrienne, aka The Iowa Farmer's Wife, and I am delighted to be guest posting at Toddler Approved today! I have two little munchkins, Sweet P who is 3 and Baby Blue who is 8 mos old. We love sensory activities and outdoor play so we combined the two to create our Water Baby Sensory Bin. Playing in the water table is one of Sweet P's favorite activities, but Baby Blue is often sitting on the blanket nearby or standing assisted at the table. He can't really reach the things he wants so I decided I'd create his own water table, baby-style! The size of the bin was perfect for him to sit in without falling over when he reached for something. I threw in a few of his favorite bath time toys along with some new items for some water baby fun! He loved it! The water was a bit deeper than what I usually do in the bathtub so he loved splashing his legs and hands in the bin. Grass was an added element! The height of the bin allowed him to reach over the side to grab grass when he wanted (he loves grass). As you can see, Sweet P couldn't resist joining in the fun! She thought this was more fun than her water table (you can see it abandoned in the background)! Sweet P showed Baby Blue how to pour water and scoop water, which was a great way for them to interact with this activity. 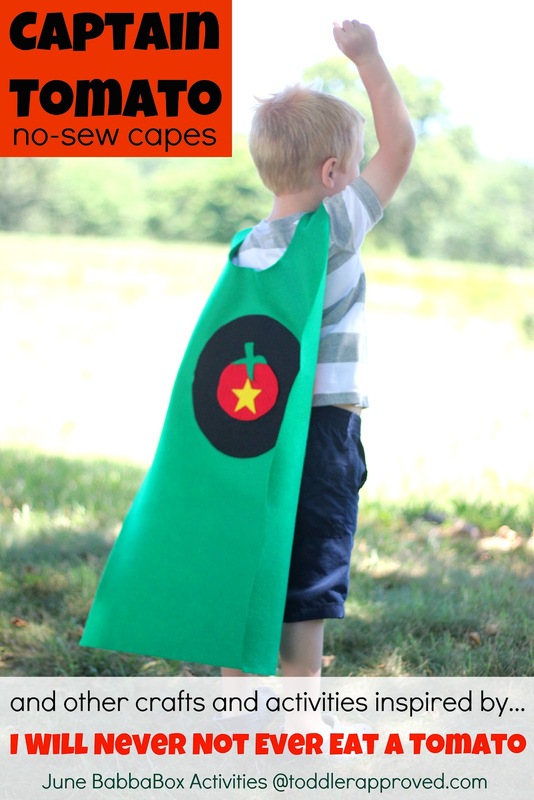 The Iowa Farmer's Wife is a mommy blogger and mother of two who enjoys sharing simple ideas about crafting with kids, frugal living and healthy eating. She lives in the Midwest and chronicles her family's indoor and outdoor adventures on her blog, http://theiowafarmerswife.com/. Did you catch my post yesterday about getting your kids to eat their veggies? I love how she decided to climb in with him! We're getting ready for a few trips this summer to family and the mountains and we were planning to do this very thing for a little water fun with the baby. 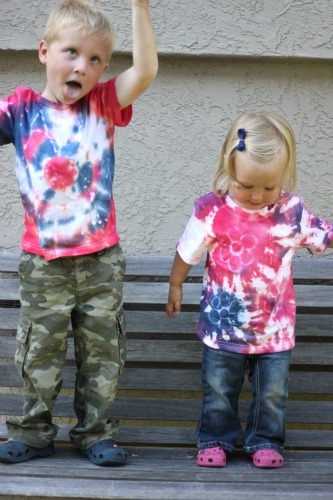 Thanks for sharing, so great to see you on Toddler Aprroved! I love how he's in the tub :) So cute! I should get something that sized for C. I think he might even like that better than the baby pool. Oh my goodness I love that he climbed in! This is way too cute! Your bin is fabulous. I especially love the waterproof book. What a great idea.